A low-cost resort getaway catering to the whole family can be found on the shores of beautiful Lake Champlain in New York’s Adirondacks state park.A low-cost resort getaway catering to the whole family can be found on the shores of beautiful Lake Champlain in New York’s Adirondacks state park. I found a vacation destination where my entire family felt like we were kids again. Sure, this is no big deal for my two teens, but for my husband and I, we seemed to have hit the Ponce de Leon jackpot. Perhaps you too are looking for a resort where you don’t feel the need to lock your cabin door, where your toughest decision of the day is whether you should canoe, windsurf or water ski? I found my Manna at the Normandie Beach Club. 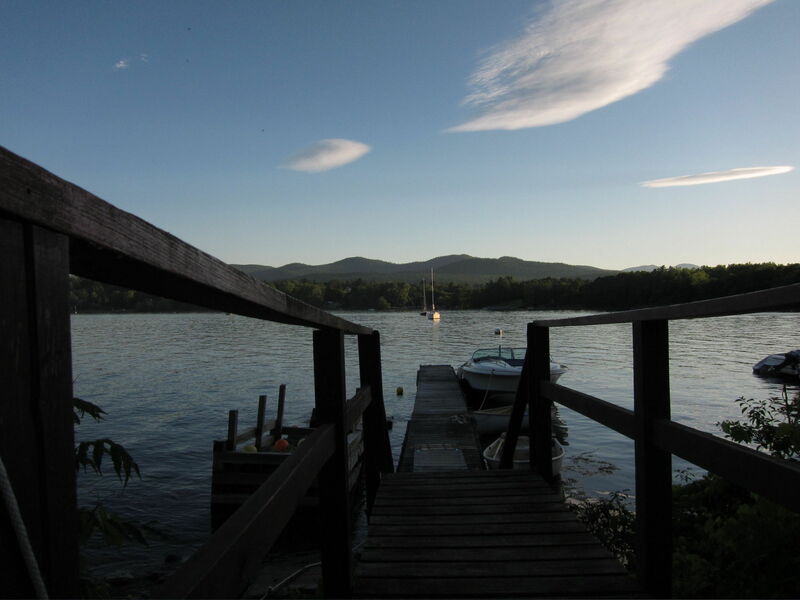 It sits on 1000 feet of Lake Champlain shoreline, in Westport, New York, a picturesque all-American village in the heart of the Adirondack State Park. The sandy beach is its star attraction, offering cool water and stellar views of Vermont across the lake. The Normandie Beach Club is owned and seasonally operated by husband and wife team Molly and Waldemar, who live in a beautiful stone house on the grounds, and put their heart and soul into the resort. They are always available to lend a hand, without ever being obtrusive. The property was a children’s summer camp until 2006, when it became a family-friendly resort. If you like water sports, you will not be disappointed. The beach is home to dozens of boats, all yours for the taking. If you need instruction, the very available water front staff is happy to teach you and your kids how to windsurf, sail, kayak, canoe, etc. All these activities are included in your cabin rentals reasonable rate. If you decide to try your hand at water skiing, you will be in Waldemar’s very able hands. 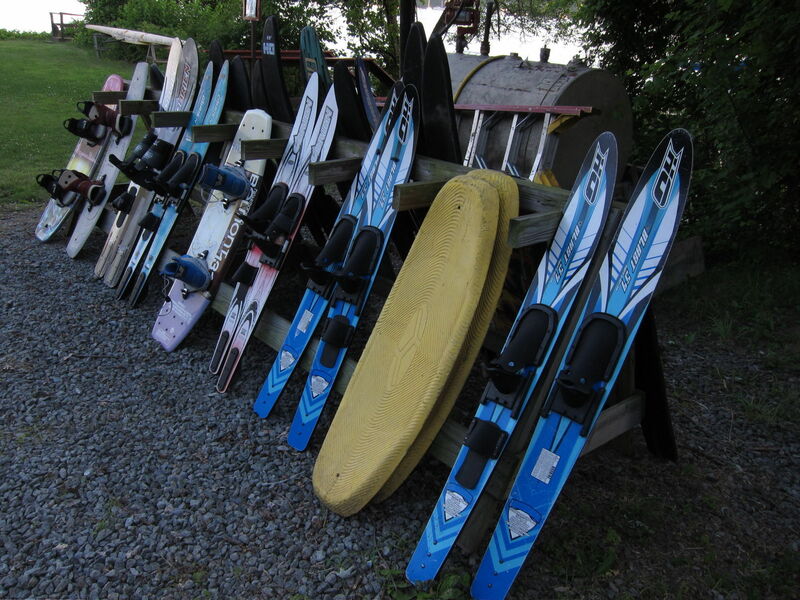 There is a reasonable fee for motorized water sports, which include wakeboarding and wave-runners. If you prefer to relax on a chaise longue with a good book, the staff will gladly supervise and instruct your kids. It is all very informal, with the hard working staff at its helm. During our recent weekend visit, we enjoyed getting to know this multi-lingual, energetic assortment of young people from Scotland, Jamaica, Colombia and France. Watching the international staff cooperating in the running of the resort gave me the sense of being privy to a sort of miniature United Nations in action. Many return to work at the Normandie Beach Club each summer, and all have a positive, chip- in- wherever- needed attitude. The young person who helps you to rig a sailboat at the waterfront will likely be bussing your breakfast table in the morning or helping you to check out when you depart. I think you’ll see from this video my kids made just how much fun we had. Thirteen renovated cabins of different sizes and configurations are for rent. Each is spotless, and includes a well-stocked kitchenette for preparing light meals and snacks. This proved to be a money saver for us, as we stocked the fridge with snacks for my kid’s round-the-clock appetites. Cabins are furnished in a simple camp-style, nothing fancy, but functional and comfortable. There is air-conditioning and cable television as well, but even my television-loving son was too busy boating to watch more than a few minutes. Our cabin was near the pool and children’s play area, but many have lake views. All accommodations include breakfast each morning at the Coco Café. It consists of a cold buffet and a single hot dish that changes daily. We sampled pancakes and French toast, both tasty. Coco Café is open for lunch, offering a simple menu of sandwiches and salads. If you can’t tear yourself away from your beachside lounge chair, they will be happy to bring lunch to you. At dinner, the Coco Café transforms into a fine lakeside restaurant, when the French-born chef flexes his culinary muscles and prepares a range of delectable dishes. My husband and I enjoyed the scallops, while my kids where happy to eat ravioli and pizza. 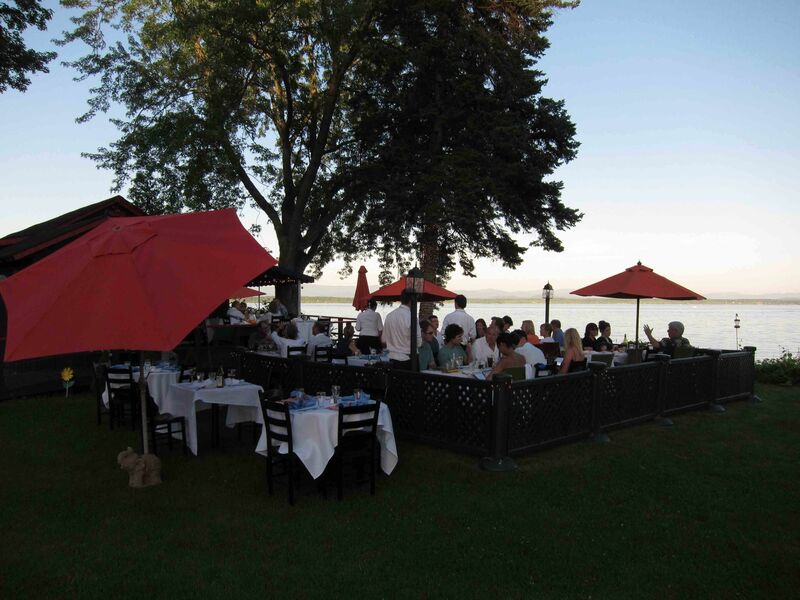 Every flavor seems enhanced by the stunning view of Lake Champlain. Conversations flowed easily between the guests in such a casual environment. All of the young children seemed to have made fast friends with one another. My teenagers were only a little younger than the staff, and they were quickly taken under their wings. The hotel is pet-friendly, and the owners have their own menagerie of playful rescue dogs, so lots of romping pooches are on hand. There are even two pygmy goats, a brother and sister pair named Colin and Blanchette, adding to the Doctor Doolittle atmosphere. For rainy days, there is a lending library of books and films, a computer room and a rec room with arts and crafts supplies, foosball and board games. There is also basketball, volleyball, ping-pong and tennis, with racquets and balls for borrowing. I met two families, both of whom made annual visits to the hotel a family tradition. They praised its laid-back attitude and helpful staff. One mother of 7- and 8-year-old children told me that her favorite thing about the Normandie was that she could let her kids have breakfast at the Café by themselves, knowing that the staff would keep a watchful eye on them, while she and her husband could catch an extra 40-winks. Another mom told me that this was the one time all year that she left her make-up bag at home. The Normandie Club is not the place to come if you want to dress for dinner. It is a comfortable place to kick back and have fun. I also met several families who live in the area and use the Normandie as a daily beach club. I conversed with a nice family who arrived in a rowboat. They live on Lake Champlain. I wondered out loud why they came to the Normandie when they have their own private beach? The mother explained that at the Normandie, their kids learned to handle a variety of boats under the helpful eye of the staff. Her oldest child was learning to windsurf, and the instruction came with no extra charge. She used the Normandie as a kind of summer camp, where her kids can mingle with young guests, finding fast playmates for the afternoon. 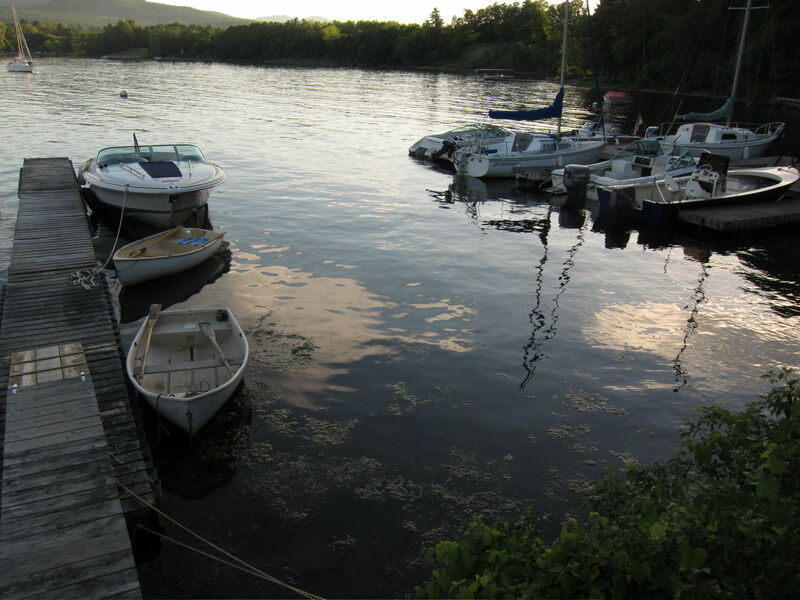 Westport is a two-hour drive from Montreal, a short ferry ride away from Burlington, Vermont, and a five-hour drive from the New York Metropolitan area. Westport is a stop along Amtrak’s route to Montreal, so families without a car can get here fairly easily. The train station is a mile or so from the Normandie, and someone will be happy to come and pick you up, with advance notice. The resort is self-contained, but it would be a shame not to explore this beautiful region. You won’t find a supermarket or a chain store in Westport. It is a one street town, where you can purchase basic groceries at Ernie’s or Everybody’s, which features organic produce grown on the owner’s son’s farm, and Whoppie pies baked fresh daily by an 84-year-old local lady. You will also find a summer stock theatre, appropriately named the Depot Theatre, as it is located in the Train Station. If you enjoy a round of golf, the Westport Country Club welcomes visitors to play its PGA rated 18-hole course. You can have lunch here as well, and enjoy the views from the panoramic outdoor seating area. What I liked most about Westport was the genuine, friendly locals who are happy to direct you to their favorite hiking trails. It was tough to leave the cocoon of the resort, but once we did it paid off. We enjoyed visiting neighboring Essex on our last evening, a scenic lakeside village 10 miles away characterized by its lovingly restored pre-Civil War architecture. The stunning views of Lake Champlain from the town docks did not go unappreciated. We had a delightful dinner at the Rudder Club, starting with seafood chowder, a fisherman’s net of briny treats. The salad was dressed with a homemade dill or raspberry vinaigrette. Our main courses were uniformly terrific, from the seafood to the burgers and grilled chicken. The Rudder Club is a family affair, with convivial owner Randy Sherman running the house, and his delightful mother Debbie, a special education teacher, waitressing during her summer vacation. This sort of personal, family-owned business is typical of the area. We left the Normandie Beach Club thinking that it would be a great venue for our family’s long overdue reunion. It offers so many activities, we think that each member of our diverse extended family would find something to enjoy. Fair prices and good value mean it would fit into most everyone’s price range, especially when you consider the vast array of activities available at no extra charge, the possibility to prepare light meals in the kitchenette, and the bountiful breakfast included in the rate. We think the Normandie Beach Club’s casual, carefree vibe would be a hit with many families, just as it was with us. I've been to Westport and it is beautiful, but I thought there were only small B&Bs up there. This is a great story and video. Seems like a wonderful place to visit with the whole family – we will be back! What a great looking resort. Sounds like a good choice for my own family. Terrific to have a video, it really helps to give a sense of the location. Sounds like a great resort for my own family. Nice to have a video, it really gives a sense of the resort. WE will give it a go next summer. Our daughter went to Camp Normandie back in the day. What a great experience We had our family reunion at Normandie and everything was just perfect. Molly and K are perfect hosts. Absolutely LOVE this! When I next get a chance for a holiday, I will remember this one. It looks so much fun. I particularly love the video tour from your kids. lovely to see Alec and Magdalena. The video is so nice. Our family from Germany had a great time at the Normandie Beach Resort, enjoyed the beach, canoe trips along the beautiful lake shore, waterski lessons and the great food at the Coco Cafe. They will be back! This past weekend I was a lucky member of the Straus party & I had a fabulous time at Normandie, where I enjoyed swimming, kayaking, rowing, fishing, & sailing — all in just a couple of days that included two hikes in the Adirondacks! Normandie is beautiful, the staff is terrific, & the food really hits the spot. I was halfway home to Brattleboro, Vermont, before I reached in my pocket & discovered that I'd failed to turn in the key to rm. 10A — sorry 'bout that! I'll get it in the mail to you tomorrow. Again, many thanks for a wonderful weekend — I hope to see you at the Normandie sometime soon!